For a game as long and convoluted as Chronicles X, the player's character is mute and disappointingly lackluster, a somewhat passive vehicle around which things happen and people congregate. The Earth has been destroyed, its demise collateral damage as two galactic civilizations make war, and you are part of the new society of survivors on the planet Mira. Your pod is found in the wilderness, you have lost your memory, and you are brought back to New Los Angeles as something of a celebrity. You are placed in an elite BLADE squad of warriors that become -- along with dozens of other minor and major characters you discover and fight alongside -- your new family. Quirky, odd, excessively melodramatic in that typical JRPG fashion, where every exclamation feels like hyperbole, the characters are at least memorable, if occasionally grating. 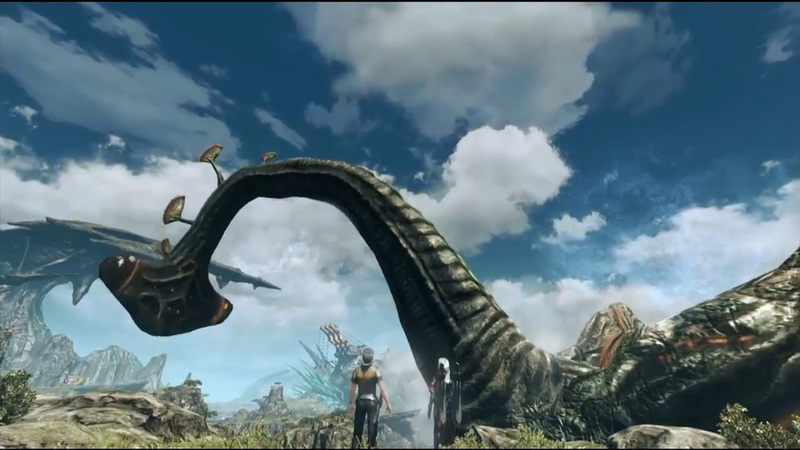 Unlike the Wii’s Xenoblade Chronicles, with its philosophical underpinnings, the story in Chronicles X is more grounded in getting you out of the city and into the incredibly vast countryside to do battle with an inexhaustible selection of native flora and fauna, alien inhabitants, and the world itself. Just following the main story beats will always place you at an underleveled disadvantage, so Chronicles X offers you an endless supply of fetch, Affinity, and kill sidequests that have the secondary objective of grinding you to the proper level to continue the main plot. As meandering as Chronicles X can be, and as confusing and opaque as its dozens of interconnected systems are, it is never a disappointing time just exploring the incredibly varied and artistically beautiful planet of Mira, a real accomplishment for a genre that has no shortage of well-conceived worlds. Happily, the game does a pretty good job of keeping this imposing planet navigable, with lots of travel options and a slick integration of the Wii U’s gamepad touchscreen. Where Chronicles X drops the ball a little is in its character archetypes, falling a little too easily in the cliches seen in so many JRPGs -- from the chisel-jawed hero to the anime-eyed, over-sexualized pre-pubescent girls, to the outfits that suggest an upcoming date with Christian Grey -- the plants, animals and environments show no lapses of imagination. It is a world fully realized, though one that can't really be altered by your character’s presence in it. About halfway through the game -- 30 to 40 hours in -- your character receives the ability to pilot a Skell, the iconic giant mech suit, and this changes the game quite a bit, opening up new areas to exploration and reducing formerly impossible enemies to plausible encounters. Of course, getting the Skell license is a major quest in itself, and maintaining it properly and keeping it intact in battle both add a little gravity to combat that was missing in the generally, consequence-free first half of the game. 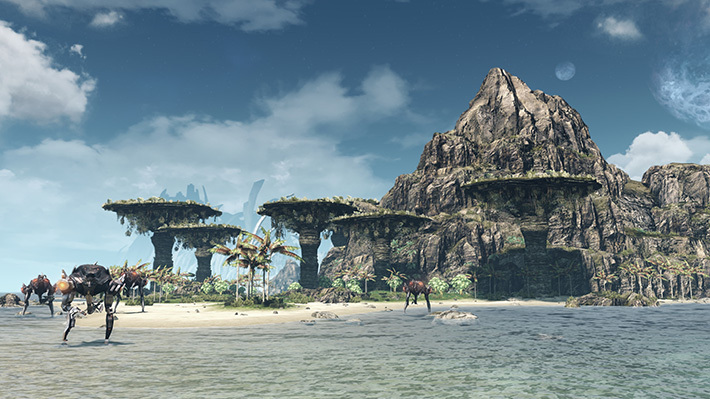 Combat in Xenoblade Chronicles X is fast, fluid, frenetic, and unlike many JRPGs, not turn-based but real time. Using a hot bar system like many MMORPGs, the player has a dizzying array of choices for melee and ranged weapons and timed buffs, special abilities and healing. A little like Fallout 4’s VATS system (without the slowed down time) you can target individual body parts and the capable AI team members coordinate well. There are lots of stats and nuanced systems at work in combat, and they’re not well explained, but until those systems come into focus, intuitive button mashing will carry you through. There is a comprehensive offline manual available, but no contextual assistance when you need it. Chronicles X has thousands of lines of voiced dialogue and most of it is quite competently acted. As is so common in epic JRPGs, there is a lot of text, and much of it is there simply to help layer the world and its people. The soundtrack by Hiroyuki Sawano is kind of a hot mess mash-up of genres -- hip hop, J-pop, symphonic -- that’s a little too incoherent, too constantly present, and too relentlessly upbeat. While the art design of Mira is consistent and beautifully rendered, the music’s patchwork aural tapestry is more distracting than supportive. As recently as five years ago, critics were complaining that many games -- Batman: Arkham Asylum, Bayonetta,Metal Gear Solid 4, God of War 3, Uncharted 2, Modern Warfare 2 -- were too short, but this year’s crop of games -- Fallout 4, Rise of the Tomb Raider, Assassin’s Creed Syndicate -- are sprawling and dozens of hours long, and Chronicles X dwarfs them all. More impressively, it is conceptually massive and not just cluttered with busywork for the sake of a bullet point. But there is a very real trade off, which is the long-term commitment that the game demands to even begin to appreciate and understand its systems, combat, and story. It’s overwhelming to realize that planet Mira is not just a painted backdrop, but a fully accessible environment filled with things you need to do. Many gamers will never see more than a fraction of it, because it’s just too big and the story dripped out too slowly. There is no doubt that Xenoblade Chronicles X is something of a milestone masterpiece for the Wii U, and probably the biggest game that system will ever see. Its environment is fantastical, its combat engaging and fun, and the opportunities for exploration are nearly limitless. But, like so many ambitious products, there are flaws: cliche characters, too many systems to manage, a diffuse main story, a grating and disjunct score, and most seriously a player character that essentially has no emotional impact. It is impossible not to admire and be impressed by Xenoblade Chronicles X, to not have many hours of fun with it, but it’s a hard game to love. If you’re looking for a game massive, multifaceted, and fun enough to eat your life for the next six to twelve months, you’ve found it in Super Smash Bros. for Wii U. As I go about my day, I have to stop and wonder why I’m not just staying in and playing Nintendo Land. The game is more fun than I ever thought it would be—it smartly adds to the games as you get better at them, providing you with a greater challenge as you progress through and giving you so much more to play and experience.